This year for Christmas I asked everyone what dish they would like me to cook for Christmas dinner. My youngest said macaroni and cheese. I figured it would be too many carbs for dinner since I was already making mashed potatoes and gravy. So I changed his request up a little bit to get some green vegetables in the meal. In a large pan, melt butter over low heat. Stir in flour, salt and pepper until smooth. Gradually add milk. Bring to a boil; cook and stir for 2 minutes or until thickened. Add cheese, stir until melted. 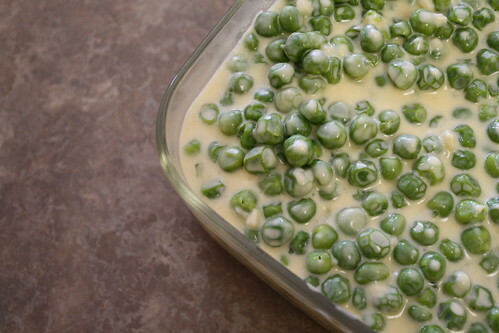 Stir in peas, cook 1 to 2 minutes or until heated through. Posted on December 30, 2012 December 30, 2012 by cookingwithpizazzPosted in Holiday, VegetableTagged Food, Holiday, Recipe, Vegetable.